A favorite of our family, this vegetarian swiss steak can be created in a cast iron skillet, but using the crockpot or other slow cooker gives this dish a marinated flavor that will make your family ask for this often! It also cooks to a deliciousness in your oven. 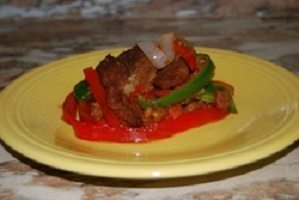 Prepare seitan (gluten) with beef flavored seasoning. Mix flour, cornmeal, and paprika. Sauté gluten in the skillet, turning to brown evenly, until crisp. Alternatively, you may lightly oil a baking sheet. Bake at 350° about 20 minutes until medium golden brown, turning once. Remove gluten from skillet or baking sheet into a glass baking dish. Sprinkle with Worcestershire sauce to cover all pieces. Using the same oil in skillet, cook onions until soft and translucent. Add sliced peppers and sauté about 3 minutes more, until softened. Put gluten back into skillet with the onions and peppers. Continue to cook in skillet on medium heat about 15 minutes to mix flavors and heat through. Put into glass baking dish. Bake at 350° for 15-20 minutes. OR– Put into a large slow cooker. Cook on medium for 2 hours or on low for several hours until ready to eat. Serve over cooked brown rice. You may choose to serve over egg-style noodles, if you prefer.